The US has been shattered by the longest government shutdown in history. How grave can the consequences be? We talked to Laurence Kotlikoff, professor of economics at Boston University and write-in candidate in the 2016 presidential election. Sophie Shevardnadze: Laurence Kotlikoff, thank you very much for being here tonight. It’s a pleasure to have you with us as usual. It’s the first time you are on my program, but we love you on our channel. Laurence Kotlikoff: My pleasure, it is great to be back here. SS: So anyways, lots of talk about Donald Trump is at loggerheads with Congress demanding 5 billion dollars to build his wall with Mexico, obviously something that Democratic-run Congress won’t give to him. Do you feel like it’s a win or lose situation, is this a zero-sum affair or is there a way out of this thing? LK: Well, there is a way out which is that whether the Democrats want is to have amnesty for the millions of young children who grew up not as citizens of the US, but grew up in the US because their parents brought them over and got them into the country. The parents don’t have legal status, but the children have, they are living in the US, some of them are going into the military and if the President would make a humanitarian deal on these young people to give them, grant them citizenship, I believe that Democrats would give in on this wall and we would have get the government back to work. SS: He says, Trump says, that you know, he has claimed the high ground by saying that he promised this wall during the election campaign and he got elected, so he has got to do what he had promised, but then I saw the CNN poll and that actually shows that most of Americans blame him for this crisis and his rating is around 40%, which is pretty low. Do you think he can really appeal to popular sentiment right now? LK: Well, I think that the only people that really like him anymore are his narrow base, so this is a relatively small segment of the electorate that really loves him and they will probably go out and vote for him next time round, but whether that is enough people to win the election? I doubt it, I mean we just had a congressional election and he really lost lots of seats for his party, so I think he is somewhat delusional on this and many other issues. SS: So far the situation has resulted in a longest ever government shutdown in the United States, right? LK: Yes, it’s not even saving us money, because we are telling these workers that whenever they will come back to work, we will give them their back pay, that is a bill that was just passed by Congress, on both sides of the aisle they voted for that so basically what we are saying is “we are going to give you the same money, just don’t work”. And that is ridiculous, also these people can’t get by day-to-day until they get their checks, so it’s not the way a grown-up government should work. SS: So I have two questions regarding that. First of all, is this government shutdown like a huge deal, because I have seen other government shutdowns in America and somehow country still functions and it is fine. Is it like a huge deal, or they are making a huge deal out of it? LK: I think it’s a pretty huge deal. It is going on for weeks and we have certain people who are actually being required to work, like the transportation safety workers and not getting paid, so at some point we are going to say “forget it, no one will be able to fly in the country, because no one will be clear for security”. So this is becoming a big deal, yes. And Trump is just deadfast set on not giving in, not showing to have yielded. So, he is a kind of a bully, who thinks he is all powerful. SS: Well, he’s a real estate tycoon and that’s how he runs the country. So far it has costed 3 billion dollars to American economy, so I feel like very soon it will be easier to build this wall than not to build it, is that what he wants, to just sort of bring it down to total absurdity? LK: Well, he is doing a lot of economic damage in lots of areas, not just shutting down the government and that has its cause, but if you look at our trade relations with even Canada, Mexico, Europe, China.. these are not good. You know, he did say that we struck a new deal with China and sort of with Canada and Mexico to replace NAFTA, but I think this is basically a minor change, he basically did not win that fight and he just left bad feelings on both sides. So, he withdrew from the TPP agreement, which is a big deal. So now, I think we are going to see through time that the US will be increasingly isolated and you will have China making trade deals with Japan, South America, with Europe, Canada, so the US will just become a minor, you know, we can’t take on an entire global economy in terms of fighting. SS: I heard so many experts say that, you know, whatever is going on right now in the US, the country will be locked in a partisan bickering for 2 years to come at least, do you feel like this is just the taste of what is going to happen? LK: Yes, I think it is just the beginning, I think everything Trump has done and all his associates will be brought back up by the Democrats in the House in hearings. So you will have… because the Republicans were running the Judiciary Committee and now the Democrats) are, and also the Oversight Committee. The Democrats are going to subpoena people and put them under oath and get them to say things Trump probably does not want to have said. SS: Obviously this wall seen by Trump as a bulwark “…” (7:15) against the illegal immigration is a focal point of this commotion, earlier, I remember, I heard you say that illegal immigration should also be curbed, right? LK: So in general we’ve had people moving from agriculture which is where machines were replacing workers for a long time now, into the cities, to work on factories, in services, so we have to just consider how we are going to deal with the immigration that we have projected, that is… projected under current walls and if we don’t have a game plan for dealing with that, maybe we should have fewer immigrants. If we want to try to improve the skill distribution of the population, maybe we should increase the number of immigrants by bringing more skilled people. So, we should discuss this, we shouldn’t just let it happen without some kind of adult discussion and preparation. Do we need to build some new cities in the middle of the country? You know, China has tried to do that, they have tried to build new cities sometimes successful, sometimes not, but they at least do some planning and also this infrastructure, education… I think we are going to be overwhelmed by immigrants if we don’t plan for it. That’s my concern. LK: He doesn’t ski, right? SS: Right, also last year when he was there, his whole “America First” approach wasn’t very popular in Davos either and actually he keeps clashing with his foreign allies over this “America First” thing, firstly with Emmanuel Macron, because they keep arguing about it all the time. So do you feel like Trump’s America is increasingly isolated on the international scene? LK: I really think Trump is mentally ill, I have to tell you that. I think he is mentally ill, I think a lot of people in the country who have thought about it either… You know, he is not making America first with his policies, he is making America last. That’s the path he is on, when it comes to trade, when it comes to human rights, when it comes to bringing the country together on issues of, you know, racism, he is just dividing the country, he is trying to isolate the country, he has talked about withdrawing US from NATO, he just pulled us out of Syria without two minutes of thought about what the consequences of that are for the Kurds. So I just see somebody who either doesn’t know what he is dong, or is intentionally trying to damage his country. SS: Why would he want to do that - intentionally damage his country and his economy? LK: I have no idea why he want to damage our country, but I see him doing it and so either he is mentally ill and doing it because of that or he’s got some other motive, but I don’t know what it is. SS: You know, this is the most common answer I get from American experts about Trump: “I have no idea why he is doing what he is doing”. All different experts from all different fields say this about Trump: “I have no idea why he is doing that”. SS: Let’s talk about the impact that Trump’s decisions can have on global economy, because, obviously, with White House’s new approach for trade deals, it will lead to a permanent and substantial shift in global economic balance. Because right now, communist China seems way more liberal in free trade than liberal America. LK: Yes, I think in many ways China is a much more capitalist society than we are. In the long run, the picture is one of China and India dominating the world economy, the developed world economy, as they catch up through time. And there is also going to be lots and lots of people in the Middle East and Africa, sub-Saharan Africa. If you look at the projections, they are just amazing, we are going to be adding two and a half Chinas in terms of total world population through the end of the century. We have about 17-20% of world GDP right now. We are heading to about 5% GDP. So, we cannot dominate the world, we are going to be a small player through time, a smaller and smaller player, China will be much bigger, India will be much bigger in terms of their share of the world’s economy. So, we can’t call all the shots, and to start picking fights right now, when we are going to be in an increasingly small, vulnerable position, it is not a clever idea. SS: We are going to get back to this idea of, by the end of the century, Sub-Saharan Africa, China, India being the leading economies, that is very interesting to talk about, before that we still want to talk about China and America, because when Obama was in the White House, relations between US and China were rocky, because this supposed transfer of US intellectual property was coming up again, again and again. And now it’s actually one of the key issues in this whole trade war, but you have said, you were, first of all, highly critical of this standoff, and you have said that it is not even a real issue, am I correct? So if it is not a real issue, why people are willing to go to trade war over this? LK: I think the issue of intellectual property is a real issue. I think enough US companies have said that they have had difficulties in that area. What we should be doing is responding kind of kind if China is requiring that a US company provide intellectual property to the Chinese partner, we should say the same thing with respect to Chinese companies, we should invite them to come in and require them to share, to give American partners their intellectual property. In other words, we should not start an enormous trade war over that particular issue, we should go after that issue and fix it. And I am sure that there are some things China wants to have fixed on our side. Because the US is not perfect in its trade relations. It’s not like we don’t have very high tariffs on Canada, for example, in certain areas, we do. So I am just saying that the idea of starting a huge trade war, we’re trying to impose 25% tariffs on all Chinese products, which is really where we are heading in March under Trump’s policy, unless trade deal is achieved. SS: Do you think it is going to be achieved? China and America weren’t able to actually come to common ground before that, do you think this is going to work this time? They gave each other this 90 day period, right, to hammer out a deal? What are the chances that it is going to work this time? SS: Is that a worst case scenario? LK: It’s a worst case scenario, yes. SS: What kind of damage will we have on both sides? SS: China is Russia’s biggest trading partner as well. SS: Let’s say, Trump has his way, he wants China to cuttariffs on American goods, right,open up the market a little. But under the WTO rules, if that happens, China will have to extend the cuts to other countries as well, right? So I am just wondering, not just Americans, let’s assume for a second Trump has his way with China, Beijing has to open up more to American goods, but will Trump even be able to sort of rip the fruits of his victory without big competition? LK: I think there are different ways to negotiate with people, with countries, and if you make it into a war, then you are not necessarily going to win. You are going to end up with a war, and not really get to an agreement. Yes, we think that China should open itself up and normalize its economic behavior in many ways, but they have done that to a large extent, we have a lot of US companies operating in China now, a lot of European companies as well, so it’s not like everybody is being expropriated, who goes and operates in China, because we have lots of companies who are doing that. We certainly could have improved trade relations, but again, the question is how do we get there, do we do this in a public fight where the Chinese get their backs up and they say, you know, and we don’t actually get there or have some quiet negotiations and say, you have to… You know, we’d like you to do X, you want us to do Y, let’s make a deal. And also let’s make a deal on South China sea so that we don’t have a military confrontation. This is what a great dealmaker would do. He will sit down and have lots of conversations with the Chinese on ongoing basis, he’d be involved in it. I think Trump is very much uninvolved in everything. Except his golf game, from what I can tell. I don’t think he… I think he is bored by details, but the details matter here. So everything is a confrontation with him, that’s how he ran his real estate business, and that’s how he thinks he can run our country. SS: So you don’t think it’s time to pull the trigger on the WTO? LK: Not at all, that’s keeping international trade working with some rules. We should be... If we have some problems with China, the first thing we should do is taking them up with the WTO same thing with Canada, same thing with Mexico, same thing with Europe… That’s the form that we agree to work within, so he is just like a lone ranger shooting his pistol at any target that he sees that day that he decides: “That’s the enemy, and I’m going to shoot at it”. LK: Yes, if you look at Canada, and Japan, and Europe, and China, together their economies are two and a half times than a US economy right now. So, here we are picking a trade war with an economic area, collectively, that’s two and a half times larger than we are, that does not make a lot of sense. SS: As early as in 2020,there is a forecast, that China will grab the title of world’s leading economy. Do you think America will catch up to that, I am not even saying three of them together? LK: So, on some measures China may be a larger economy than in other measures, nobody know exactly what the GDP measure is, but China is the same size as the US economy already, and it is going to get larger through time, because their productivity is catching up to the US, they are investing in science, in education, universities are popping up every other day, it seems, in China, so they are investing extensively in infrastructure, they have an extremely high saving and investment rate, overall. And US is not in that ballgame. We are into the consumption ballgame, where we basically want to consume everything that we earn and not save anything for the next generation. So over time that is going to end up with China being a much bigger economy than ours. And we are going to be kind of a second fiddle in this band. We have to start to understand that. I don’t think Trump will ever understand this, I don’t think he is capable of doing this, but I think other politicians need to understand this. SS: So you are saying China, India, sub-Saharan Africa will be world’s biggest economies by the end of this century? SS: That’s why we call them third world countries. It seems very unlikely to people like us to think that in 20-30-30 years the world will be ruled by third world countries. SS: Are we also going to see the demise of the West, I am not talking only about America, Europe is also one of the leading economies right now as well. So if you’re saying that those countries are going to come up front, that means that the West sort of retiring? LK: Western Europe, Japan, the US, Russia, that entire collection of countries and regions that have been the main economic players for decades now, over time they are going to become much smaller players. The world is going to evolve. China, India, Middle East, Africa, under certain scenarios they are going to represent 80% of world GDP at the end of the century. And that scenario is where they do catch up in terms of their productivity growth. So, one of the concerns I have is that superpowers don’t like to become second-rate players. So if you look at the history of the empires, it has been difficult for an empire, which for economic and demographic reasons is becoming overshadowed by another empire, and another empire is on the rise, and this empire is on the decline – that usually happens in a context of a war. The empire that is declining doesn’t feel happy about it. They are too upset about it and start a war. And I am worried that something like that will happen… The US has to become over time less important, because other countries are growing much more rapidly, just in terms of demographics alone. But then you also have the fact that this technology that were… that we have, they can acquire quickly right over the Internet. So we’re in a different world than we were in the past. These countries can learn things very quickly and get the best technology just for free, to a certain extent. 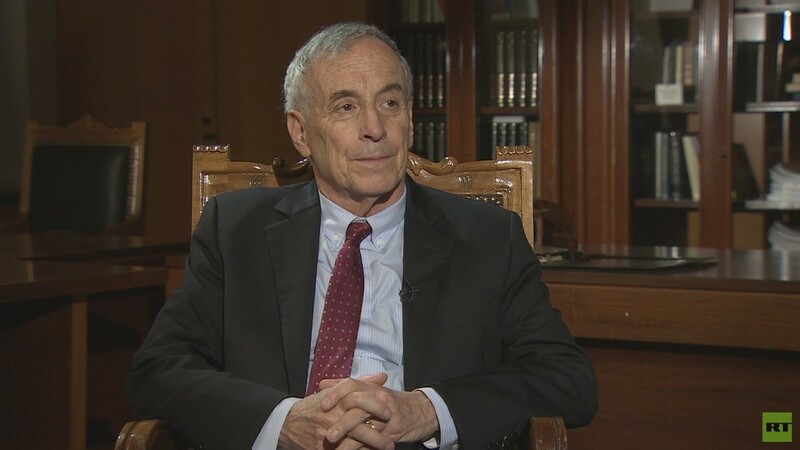 SS: Laurence Kotlikoff thank you very much for this interview, it has been great talking to you, good luck with the Gaidar model, and all the best to you.